Excerpts can be misleading. 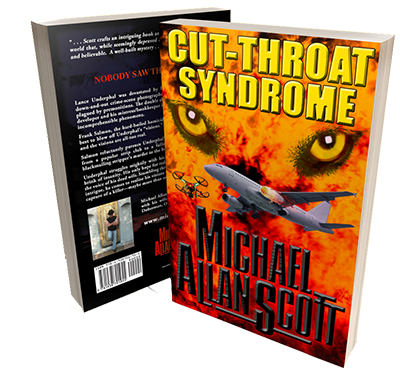 In the case of Cut-Throat Syndrome, they couldn’t be anything but. This tale is too far-ranging to get a sense of it from three excerpts, much less one. Wind rattles the trailer window-screen, moaning as it snakes through the brittle weather-stripping. I lie awake in the dark, still early, three a.m. or so, Callie and Chopper snoring peacefully. Life is so strange, nothing like I imagined, nothing like I planned. Callie’s warmth comforts me. Even in slumber, her vibrancy reaches deep, touching my soul. And here we are, brand new, never having been here before, perfect in this here and now known only to us. Moments like this are rare gems, the treasures worth all the pain. And once these moments pass, they’re lost forever—fading memories never to live again. Too often life’s best moments have slipped through my fingers like seawater, leaving the stain of tears in their place. As my mind wanders alone in the dark, I think about how and why I’m torn from joys of the present by sorrows of the past. My wife, long dead these many years, yet with me still. Lost to me in life—her touch, the scent of her, Sonja’s warm embrace, ways of her I’ll never know again. When I get like this she is quick to remind me she hasn’t gone anywhere. And while that’s true, she is with me in spirit only, no longer of this world. No more flesh, no more tears, yet no more rainbows. Who is to say what matters most? Here in the darkness, shadows melt into pools and I’m reminded, Callie brightens my world like no other. Without her I’d still be adrift in a darkening past. Could I ever have known love like this without losing Sonja? All I know is what I feel. Callie, making life worthwhile once more, something I never expected. The dormant townhouse explodes in spastic fits of fiery cannonade, its dark windows flaring with muzzle flash, its security system honking in the still night air. Staccato bursts of automatic weapon-fire roar across manicured lawns, rousting neighbors from their evening stupors, their windows lighting with alarm, their phones pulsing with panicky 911 calls, their tranquility ruptured by chaos. Stray rounds erupt from shattering panes to whine angrily into the darkness, setting off car alarms, pinging off light poles, powdering red brick on impact. One slug ricochets off a perimeter wall; another buries itself in the rough bark of a roadside Douglas fir; another punches through the driver’s-side window of a silver Accord out on the boulevard, burrowing into the temple of a twenty-nine-year-old white male, horrifying his skittish date as blood sprays across the dash, the windshield, the side of her face—his body spastically jerking as his head drops into her lap. Collateral damage. Time slows to a crawl, endless seconds creeping by as violence suddenly dies. Vacant windows go dark, the crackling pops of gunfire silenced. Wisps of white smoke and the acrid stench of cordite leak out between jagged shards of glass. Frantic residents whisper their horror as they hide in closets and crouch behind couches, terrified. Long before emergency responders arrive, long before the morbidly curious gather in throngs at the crime scene tape, dark figures emerge from the backyard gate, dragging a limp form through the shadows to disappear among the vehicles parked in the delivery area. Fidgeting at the door, Frank waits as the muffled doorbell chime echoes inside. Here he is, delivering news, the worst news the wife of a cop can hear. Bad enough for the dead, they lose everything, but at least it’s over. The real tragedy is for the loved ones left behind. For the survivors, the long nightmare begins when Death’s messenger comes calling. He hasn’t ever met James Daniels’ wife. It’s a meeting neither he nor she will forget. “Yes.” Frank holds her gaze, his eyes meeting hers as he lets the words go unspoken. He hardens his heart as he watches her hope melt into despair. “I’m sorry, no.” Frank braces. Confusion twists her smooth features into a mask etched with sorrow.